This Python MySQL tutorial demonstrates how to develop and integrate Python applications that work with a MySQL database server. Python is dynamic, and enterprise language and it has all the support to build large and complex enterprise applications. MySQL is the world’s most powerful and used open source database provided by Oracle. Total 5 modules available in python to communicate with a MySQL and provides MySQL database support to our applications. Note: Above all interfaces or modules are adhere to Python Database API Specification v2.0 (PEP 249) that means the syntax, method and the way of access database is same in all. PEP 249 has been designed to encourage and maintain similarity between the Python modules that are used to access databases. By doing this, above all modules are following rules defined in Python Database API Specification v2.0 (PEP 249). Note: This tutorial based on MySQL Connector Python module. MySQL Connector Python is written in pure Python, and it is self-sufficient to execute database queries through python. It is an official Oracle-supported driver to work with MySQL and python. It is Python 3 compatible, actively maintained. All sample examples mentioned in this article are created using MySQL Connector Python. If you are using any other module to work with a MySQL database server, don’t worry. Examples mentioned in this tutorial can also work only you need to change the import statements. How to install MySQL Connector Python and use its functions to access the MySQL database. Perform MySQL CRUD operations such as data insertion, data retrieval, data update, and data deletion using Python. This tutorial also talks about transaction management, connection pooling, and error-handling techniques to develop robust python programs that work with a MySQL database server. Let see each section now. In this section, you are going to learn how to Install MySQL Connector Python on Windows, MAC, Linux, Unix, Ubuntu, and other operating system platforms. This section let you know the prerequisite to install the MySQL connector python module. Install MySQL Connector Python using pip command or via source code. 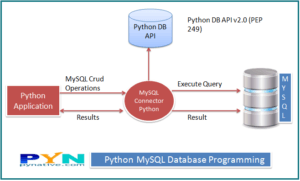 This section mainly focuses on steps to connect MySQL database in Python using MySQL Connector Python. Use the connect() method of “MySQL Connector Python” with required parameters to connect MySQL. We can also learn how to close the database connection securely. Also, learn the various MySQL Connection arguments required to communicate with MySQLServer from Python. Also, we cover how we can change the MySQL connection timeout when connecting through Python. This section demonstrates how to write and execute a SQL SELECT query from Python application to fetch rows from MySQL table. Also, learn how to process SELECT query results, Fetch all rows or single row from the table and count total rows of a table. Additionally, learn how to use the Python variable in the Select Query. This section demonstrates how to execute a MySQL INSERT Query from python to add a new row to the database table. You can also learn how to use Python variables in the parameterized query to insert dynamic data into a table. This section demonstrates how to execute a MySQL UPDATE command from python to update MySQL database and table’s data. After reading this article, you can update a single row, multiple rows, single column, and multiple columns. Additionally, learn how to use python variables in the parameterized query to update table data. The primary purpose of this section is to demonstrate how to use a SQL DELETE statement from your python to delete MySQL tables and database data. After reading this section, you can Delete single row, multiple rows, single column, and multiple columns. Delete all Rows, Delete table and an entire database from MySQL using python. This section shows you how to execute MySQL stored procedures in Python and how to pass IN and OUT parameter to the MySQL stored procedure from python application. This section demonstrates how to use Parameterized Queries or Prepared Statement from your python application. Also, you can learn how to use python variables in the query. Using Parameterized query, you can pass user-defined or dynamic data to MySQL table. This article mainly focuses on how to manage database transactions in Python while working with MySQL. Also, learn how to manage the ACID property of MySQL transactions within Python using commit and rollback methods. This Section mainly focuses on What is a connection pool and how to implement a connection pool using MySQL Connector Python. Learn how to create and use a connection pool to increase the performance of your applications. In this section, I will let you know how to insert or save any digital information such as a file, image, video, or a song as a blob data into MySQL table from python. Also, learn how we can fetch the file, image, video, or a song stored in MySQL using Python. Python database programming Quiz provides multiple choice questions to get familiar with Python database concepts and APIs. Take our database exercise to master database programming in Python. I have created a Hospital Information System exercise using Python and MySQL. This Exercise has six questions. I have provided the required tables so you can proceed directly to solve the questions of this exercise. This exercise covers all topics. In this Python database exercise, You get to know how to perform database CRUD operations From Python. The exercise also covers transaction management and error-handling techniques. That’s it. Folks Let me know your comments in the section below. Just want to say your article is as astounding. The clearness in your post is simply spectacular and I could assume you’re an expert on this subject. Just in the right time I needed this information. Thanks! Hey Nikko, I am glad you liked it. Hey is using the username and password field safe? Is there other way to be more secure? Not exposing the password in the code? Hey Niiko, It just an example so I put it in a code. But it is not the good approach. You should keep your password and all the DB parameters in a file and then read a file and use it to connect. Also, you can encrypt a password and put it in a file. and when you need it to just read and decrypt it and then use it. Hey Steve. I am glad you liked it!